The Cuisinart Griddler takes multifunctional to a whole new level! With five cooking options, it can handle everything from pancakes and sausages to grilled cheese, steaks, hamburgers and panini. A floating cover and one set of reversible plates that snap in and out turn the Griddler into a Contact Grill, a Panini Press, a Full Grill, a Full Griddle, or Half Grill / Half Griddle. Dual temperature controls ensure everything is perfectly cooked! The Kalorik Carnival hot air popcorn popper features festive carnival styling. This easy to use popper makes up to 8 cups of healthy air-popped popcorn per batch. Includes a measuring dish for added butter and a measuring cup for popcorn kernels, so every batch pops perfectly. Convenient countertop size is perfect for kitchens, game rooms, home theatres and anywhere you want to start a carnival. Easy to use and easy to clean. 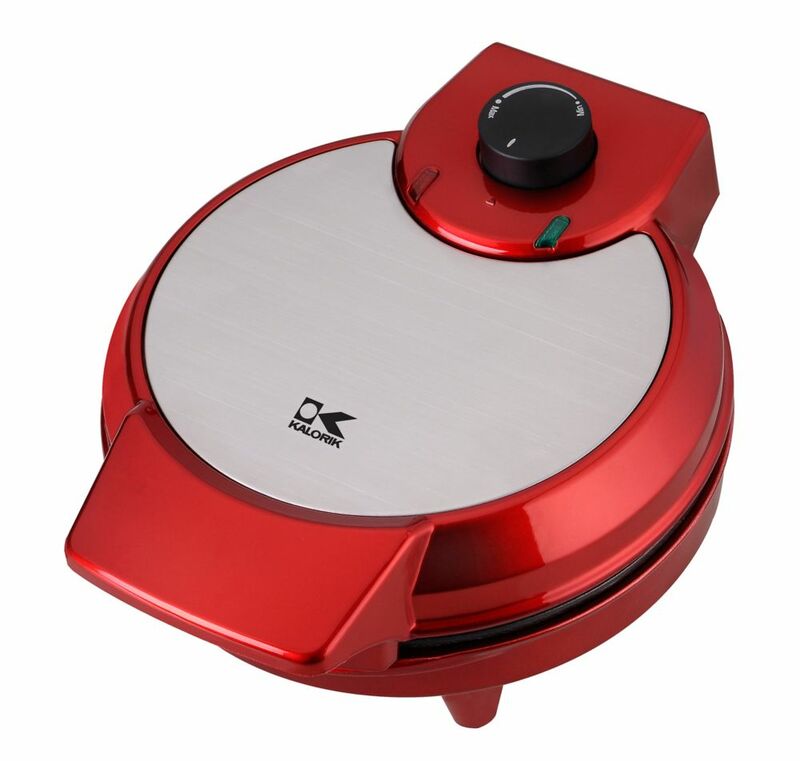 Heart Shape Waffle Maker in Metallic Red Put your heart out on the table with the Kalorik Heart-Shape Waffle Maker. Make perfect, heart-shaped, waffles the easy way! Pour your favorite waffle batter onto the plates and close the lidin minutes, you will have 5 heart-shaped waffles that are ready to serve. Equipped with an adjustable temperature control knob, you can cook your waffles to perfectionmake them as soft or as crispy as you would like. The waffle makers non-stick heating plates allow for easy cleaning and its cord-wrap feature allows for hassle-free storage. Additionally, the unit can be stored upright, saving you space. Easy to use, clean, and store, the Kalorik Heart-Shape Waffle Maker is ideal for holidays, celebrations, or whenever you are craving a fun and delicious treat to share! Heart Shape Waffle Maker in Metallic Red is rated 4.0 out of 5 by 2. Rated 4 out of 5 by interiordiyer from Works great but some pieces loose I've had the Red Heart Shaped Waffle Maker for a few months now and it works really well. It makes perfect waffles and is near impossible to burn them. My only complaint was that it was delivered with a minuscule piece loose on the inside (so you can hear something tiny rattling around inside of the machine but I'm unable to remove it), and the red light cover popped off within a few minutes of me opening the package. Neither of these effect the machine working, but it did make me doubt how well the product was made.